Mathieu van der Poel and Katerina Nash both attacked early to take solo wins at the opening round of the Telenet UCI Cyclocross World Cup. Mathieu van der Poel (Beobank-Corendon) flew off the start like he was shot out of a cannon and proceeded to solo the entire race to win the opening round of the 2017/18 Telenet UCI Cyclocross World Cup on Sunday in Iowa City. Van der Poel had fresh legs for the final and most important day of the three-day Jingle Cross Festival, as he sat out the C1 event Friday and C2 event on Saturday. Friday’s winner Laurens Sweeck (ERA-Circus) and Friday’s runner-up Quinten Hermans (Telenet Fidea) joined forces on the fourth of 10 laps, but only ever lost ground to van der Poel. Sweeck beat Hermans in the sprint for second. For the third year running, the cyclocross world cup calendar began in the United States, this year in Iowa City as part of the Jingle Cross Festival. All of the heavy hitters were in attendance and many had even chosen to sit-out Friday’s and Saturday’s UCI races to be fresh for the world cup. Van der Poel took the holeshot and powered up Mt. Krumpit, disappearing into the distance. The question was whether he be able to hold his blistering first lap pace for the entire 60-plus minute race. On the second lap, Sweeck set-off in pursuit of van der Poel, as many riders in the chase group looked to world champion Wout van Aert (Crelan-Charles) to close the gap. Hermans would bridge to Sweeck a few laps later and although the duo worked well together, they would only loose ground to a clearly on-form van der Poel. Van Aert suffered a front puncture and mechanical just after passing the pit on the fifth lap and lost a big chunk of time. However, he never gave up and was able to salvage his race and finish in 14th place. “Today was a real sufferfest for me. First time since I’m professional that I feel like this. I’ll fight back, that’s for sure! #JingleCross,” van Aert posted on Twitter. Lars van der Haar (Telenet Fidea) was able to recover from an early crash and broke away from the chase group midway through the race. He was joined after a few laps by Kevin Pauwels (Marlux-Napoleon Games), who was quiet in the early going, but came on strong in the closing laps. The duo would finish in fourth and fifth with Pauwels getting the better of van der Haar in the end. The top American on the day went to Kerry Werner who finished the day more than three minutes down on van der Poel. “Finished up 19th in the @jinglecross World Cup. Pretty happy with that. Even jumped on Wout’s wheel for half a lap, which, in hindsight, was an interesting decision,” Werner posted on Instagram. Stephen Hyde (Cannondale p/b CyclocrossWorld), the U.S. national champion, finished in 23rd. 1. Mathieu van der Poel (NED), in 01:06:28. 2. Laurens Sweeck (BEL), at +00:43. 3. Quinten Hermans (BEL), at +00:44. 4. Kevin Pauwels (BEL), at 00:54. 5. Lars van der Haar (NED), at +00:58. 6. Michael Vanthourenhout (BEL), at +01:28. 7. Toon Aerts (BEL), at +01:43. 8. Gianni Vermeersh (BEL), at +01:46. 9. Michael Boros (CZE), at +01:46. 10. Jens Adams (BEL), at +01:59. Katerina Nash (CLIF Pro Team) attacked a large lead group on Mt. Krumpit halfway through the race and soloed the rest of the way to victory. Katie Keough (Cannondale p/b CyclcrossWorld) slipped away from a six-rider chase group on the penultimate lap to finish second with world champion Sanne Cant (Beobank-Corendon) beating Sophie de Boer (Parkhotel Valkenburg-Destil) in the sprint for the final podium spot. De Boer grabbed the holeshot, as the women opened the Telenet UCI Cyclocross World Cup for the 2017/18 season. The Dutchwoman was soon passed by Cant, as the riders approached the Mt. Krumpit run-up. The world champion was able to ride the climb, as everyone else ran. 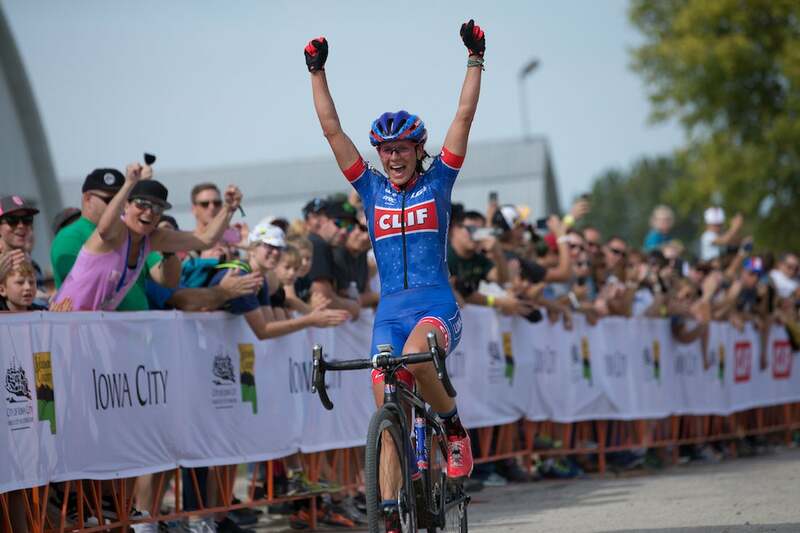 However, Italian national champion Eva Lechner (CLIF Pro Team) soon went to the font to drive the pace. Lechner was able to ride Mt. Krumpit on the second lap and opened a small advantage. At the end of lap two, the Italian was reeled back-in by 13-time U.S. national champion Katie Compton and 13 riders had gone clear. The third of six laps would prove to the most decisive of the race. Nash charged up and over the climb, establishing a lead she would never relinquish. Her attack shattered the group. Compton was nowhere to be seen, as riders scrambled to find wheels and chase back on. The American had crashed heavily. She would go on to finish in 19th place and was seen in the medical tent after the race. On the penultimate lap, Nash still held a slim advantage, but Keough was now in solo pursuit, having left behind the chase group. The chase consisted of Cant, de Boer, Caroline Mani, Maud Kaptheijns (Crelan-Charles) and Annika Langvad (Specialized Racing). Nash had time to high-five fans along the finishing straight, as she took the world cup win. Keough held on for second with the Cant leading home the chase group to grab the final podium spot. The Telenet UCI Cyclocross World Cup continues next weekend in Waterloo, Wisconsin at the Trek CXC Cup. There is a UCI C2 event on Saturday with the world cup race on Sunday. 1. Katerina Nash (CZE), in 47:27. 2. Kaitlin Keough (USA), at +00:12. 3. Sanne Cant (BEL), at +00:30. 4. Sophie De Boer (NED), at +00:31. 5. Maud Kaptheijns (NED), at +00:34. 6. Caroline Mani (FRA), at +00:36. 7. Annika Langvad (DEN), at +00:37. 8. Ellen Noble (USA), at +00:57. 9. Nikki Brammeier (GBR), at +01:07. 10. Eva Lechner (ITA), at +01:20. 11. Emma White (USA), at +01:26. 12. Ellen Van Loy (BEL), at +01:49. 13. Loes Sels (BEL), at +01:57. 14. Elle Anderson (USA), at +02:01. 15. Rebecca Fahringer, (USA), at +02:16. 16. Helen Wyman (GBR), at +02:24. 17. Christel Ferrier Bruneau (CAN), at +02:32. 18. Crystal Anthony, (USA), at +02:36. 19. Katherine Compton, (USA), at +02:52. 20. Courtenay Mcfadden, (USA), at +02:56. 21. Lucie Chainel, (FRA), at +03:11. 22. Alicia Franck, (BEL), at +03:23. 23. Maghalie Rochette, (CAN), at +03:23. 24. Fleur Nagengast, (NED), at +03:37. 25. Sofia Gomez Villafane, (ARG), at +03:42. 26. Sunny Gilbert, (USA), at +03:57. 27. Amanda Nauman, (USA), at +04:10. 28. Cassandra Maximenko, (USA), at +04:25. 29. Arley Kemmerer, (USA), at +04:31. 30. Emily Kachorek, (USA), at +04:48. 31. Ruby West (CAN), at +05:13. 32. Jennifer Malik (USA), at +05:15. 33. Rebecca Gross (USA), at +05:37. 34. Kim Hurst (NZL) at +05:53. 35. Danielle Arman (USA), at +06:04. 36. Julie Wright (USA), at +06:09. 9. Michael BoroŠ (CZE), at +01:46. 11. Daan Soete (BEL), at +02:07. 12. Corne Van Kessel (NED), at +02:20. 13. Jim Aernouts (BEL), at +02:29. 14. Wout Van Aert (BEL), at +02:32. 15. Marcel Meisen (GER), at +02:43. 16. Dieter Vanthourenhout (BEL), at +02:55. 17. Tim Merlier (BEL), at +03:14. 18. Diether Sweeck (BEL), at +03:21. 19. Kerry Werner (USA), at +03:24. 20. Rob Peeters (BEL), at +03:24. 21. Matthieu Boulo (FRA), at +03:24. 22. Steve Chainel (FRA), at +03:41. 23. Stephen Hyde (USA), at +03:55. 24. Ian Field (GBR), at +04:20. 25. Stan Godrie (NED), at +04:33. 26. Eli Iserbyt (BEL), at +04:40. 27. Jeremy Powers (USA), at +04:42. 28. Tobin Ortenblad (USA), at +04:51. 29. Michael Van Den Ham (CAN), at +04:58. 30. Anthony Clark (USA), at +05:01. 31. Maxx Chance (USA), at +05:16. 32. Thijs Aerts (BEL), at +05:25. 33. James Driscoll (USA), at +05:27. 34. Vincent Baestaens (BEL), at +05:56. 35. Andrew Dillman (USA), at +06:01. 36. Gage Hecht (USA), at +06:31. 37. Wietse Bosmans (BEL), at +06:58.